This blog was originally published on http://pegandsidsblog.blogspot.com/. I started school on Monday. We were introduced to the Pardes Institute about 4 years ago, and have attended many classes and lectures there. It’s a top notch academy with an exceptional roster of instructors. The course offerings were mind-boggling and it was difficult to choose which ones to attend. I didn’t realize what I was getting myself in to. I’d been looking forward to summer school at Pardes for months, but I didn’t realize it would be like going back to college. My brain hasn’t had this kind of workout since, well, college. And when I walked in, all I saw were kids. Uh-oh. Me and 20-somethings. Great. But grown-ups started to drift in, and someone told me that roughly one third of the 100+ students in the program are over 50. They come from everywhere – US, Canada, France, Australia, South Africa and Israel. The days are long; I leave the apartment at 8AM and don’t get back till after 6PM. The classes are 2-1/2 hours each, and I’m taking four, two of which complement each other. By the time the semester ends I’ll be an expert in the Book of Exodus. Plus additional tours, lectures and classes that get squeezed in. As an added bonus the school is across the street from a very nice mall, and I rewarded myself for surviving the first week by buying a nice pair of Teva sandals. We had a tour on Tuesday afternoon. A walking tour. In 90 degree weather. 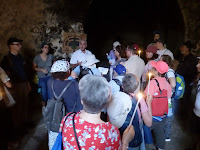 We started at the top of the Mount of Olives, walked all the way down to the bottom of the Kidron Valley thru the cemetery, with a stop at the tomb of the prophets (where none of the prophets is buried) and Absalom’s tomb (where Absalom isn’t buried) and back up to the Old City. 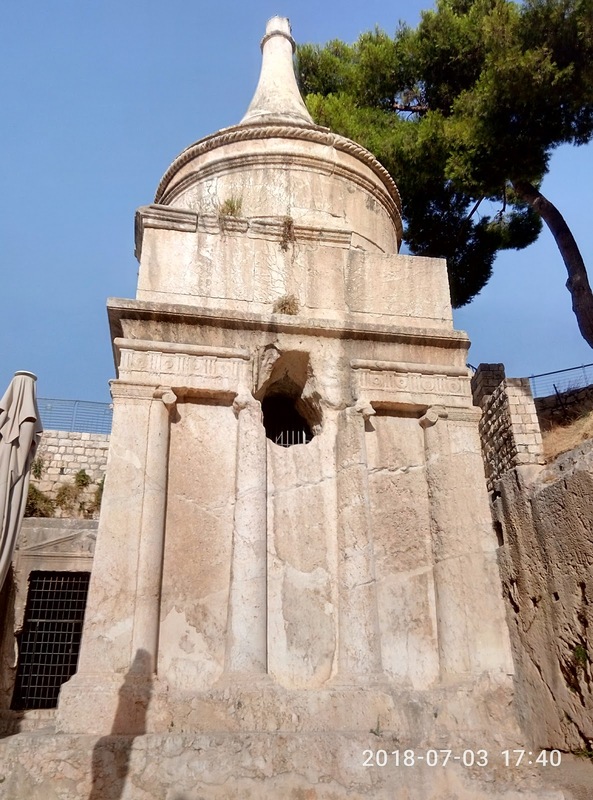 The Mount of Olives saw a lot of action during Biblical times, and not merely because it was the 50-yard line for watching the destruction of both Temples. 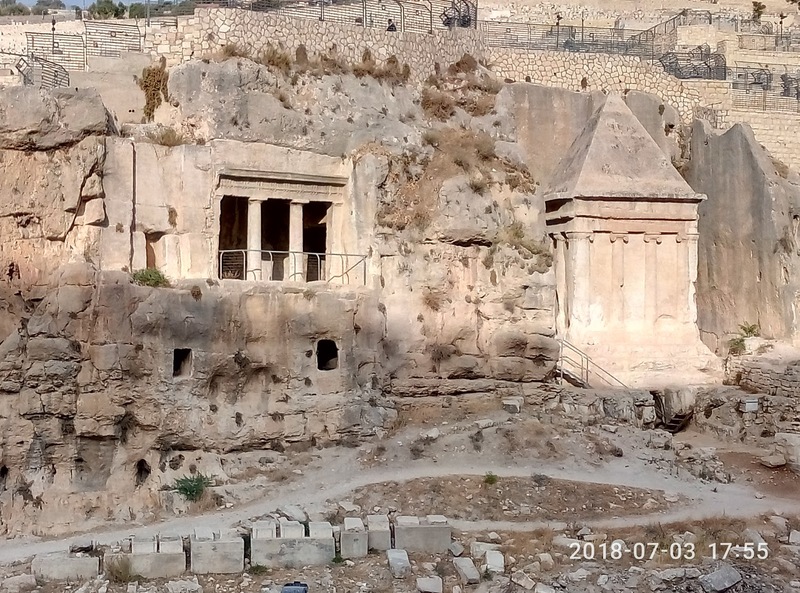 There is a place that has a direct line of sight to the doorway of the Temple, and it was on this spot that the priest burned the red heifer. On Yom Kippur the two goats were taken to the same location. Neither had a happy ending; one was thrown off the mountain and the other was sacrificed. 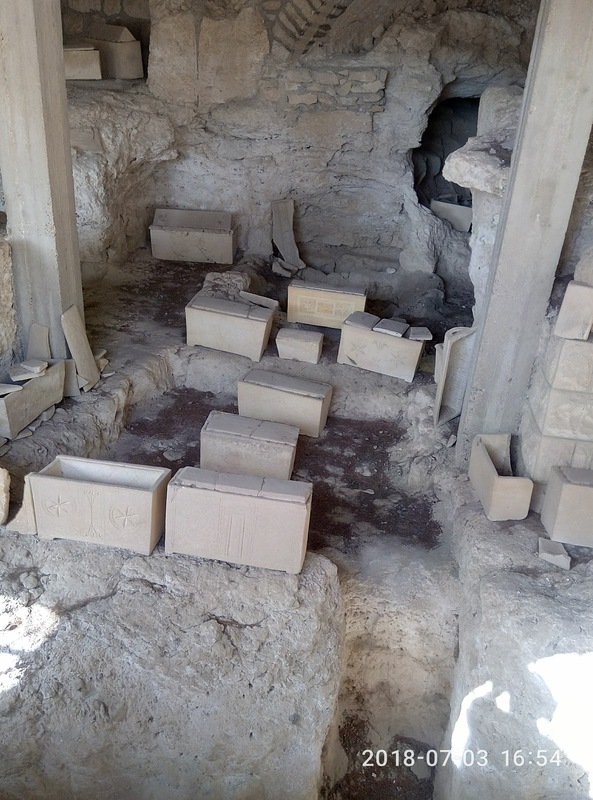 The cemetery, which is about 3000 years old, is the final resting place of people from all walks of life. 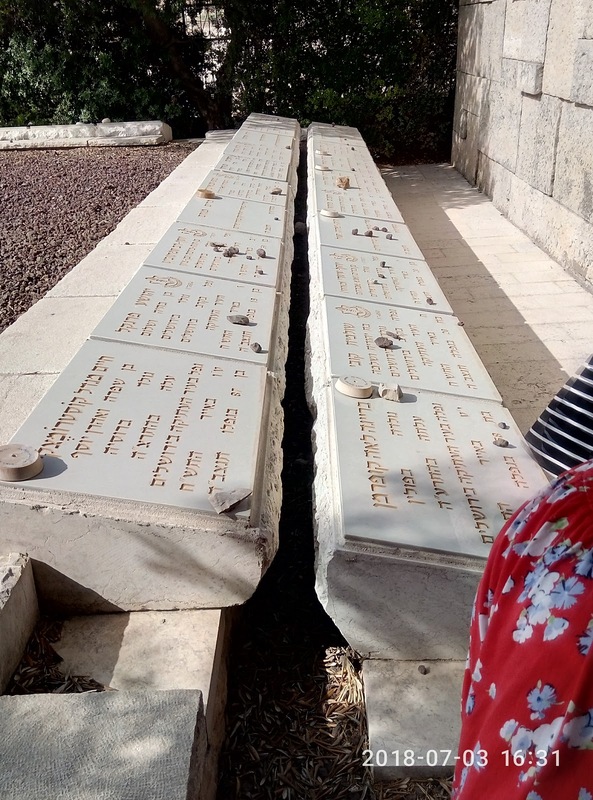 We visited the common grave of some of the defenders of the Jewish Quarter in the 1948 war. The youngest was a 10 year old boy. 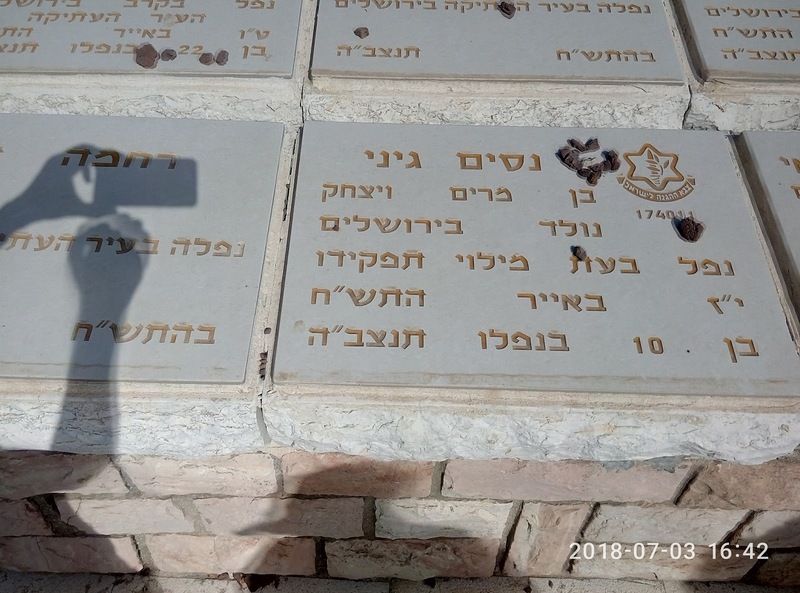 Most of the people buried there were civilians, but they were killed in combat, and they were enlisted in the IDF posthumously, given ranks and when the bodies were finally recovered from the Jewish Quarter after 19 years of Jordanian occupation, re-interred on the Mount of Olives. And it was from here that the operation to recapture the Old City in the 1967 war was launched. 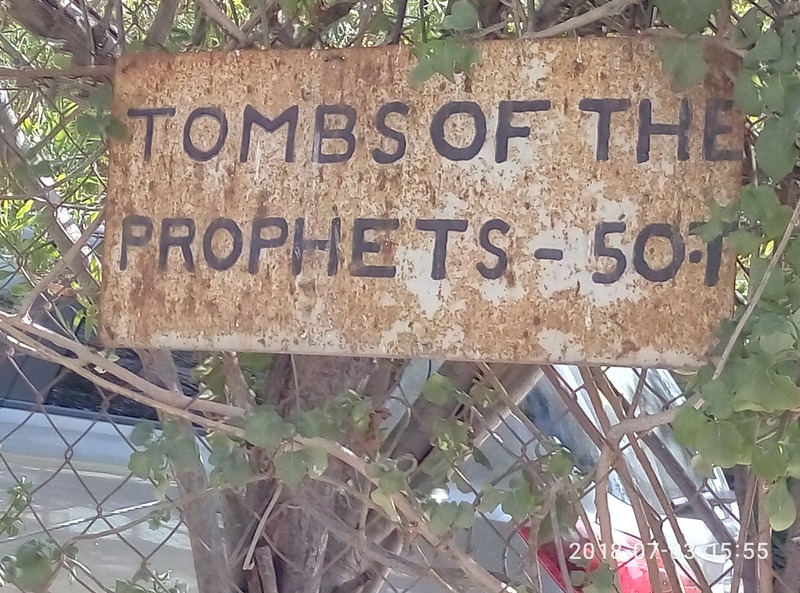 I had always understood that to be buried on the Mount of Olives today costs upwards of $50,000. Turns out it’s not true. 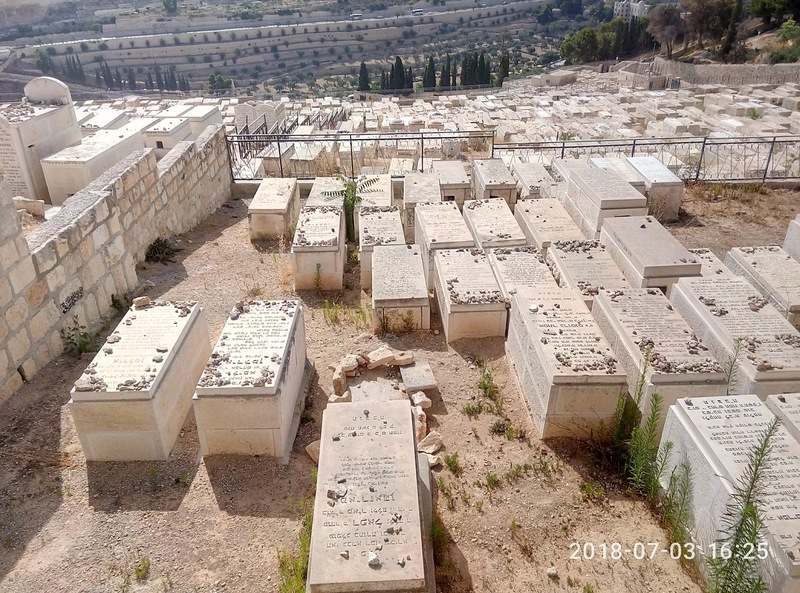 An Israeli citizen who resides in Jerusalem can be buried in any municipal cemetery. Hmmmm. Something to think about. Wednesday was the Fourth of July. It’s a diplomatic event here, even among the many Americans who live in Israel. We attended a very interesting conference sponsored by the Middle East Forum. 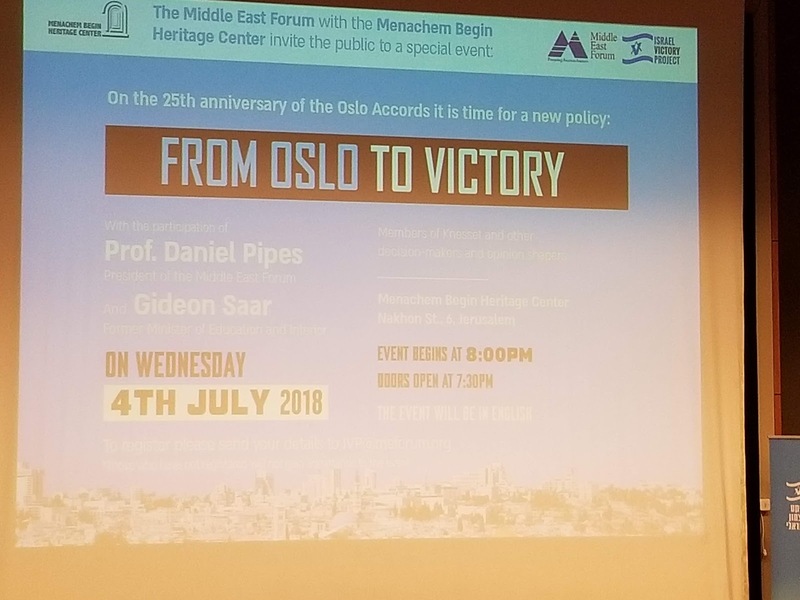 It was called the Israel Victory Project, which is a new approach to resolving our 100 Years War. 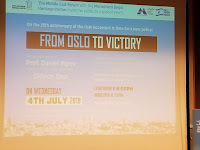 The premise is that Oslo and the “Two State Solution” were destined to fail from the get-go, and the only way progress can be made on the “peace process” is by convincing the Palestinians that there is no way they will ever be able to take over the region and wipe Israel off the map. What none of the geniuses who run the world can grasp is, that’s the core of the stalemate. As long as any single Palestinian believes that one fine day they will have a country from the Jordan to the Sea, as they like to chant, there will never be any kind of resolution. The idea has merit. But someone has to figure out how. Maybe by next week I’ll have an answer.